Copley Junior School - R.E. Our R.E. Curriculum is individually tailored to maximise our local links and fulfils all the requirements of the local syllabus. Our PSHCE lessons and daily acts of worship all contribute to the teaching of R.E. and we have many valued links in the local community that contribute greatly to R.E. lessons and acts of worship. We have a close and valued link with St Mary's Church. Our annual Harvest Service sees St Mary's filled with children, staff, parents/carers and relatives and a huge number of harvest gifts, very generously donated by families. The tinned and packaged goods and toiletries are given to Doncaster Food Bank, which supports local families in Doncaster. Harvest Service 2016 - Our theme this year was ‘Looking after our World’s Resources’. Well done to the different year groups for their research and presentations about recycling, wave energy and the importance of saving water, wind energy and sustainability, with Year 6 pupils below telling us about the ‘Dig for Victory’ campaign and the rigours of food rationing during World War II. Harvest Service 2017 - It was lovely to see so many parents and relatives at our service. Each class contributed to the theme of ‘Colours of the Rainbow’ with fascinating facts, poetry, singing and signing as well as drama contributions. We filled St Mary’s with enthusiastic singing, especially for our ‘Harvest Samba’ song! Harvest Service 2018 - Our theme for our Harvest Festival 2018 was 'My pizza as big as the sun.' During the service children from each class shared fascinating facts about the different foods that are added to make a pizza and the food miles involved, which was quite remarkable. Once again, we were very impressed with the children's wonderful singing. Thank you so much to everyone for your fantastic generosity. Packet, tinned and fresh produce and toiletries were displayed on every surface and ledge in St Mary's. Doncaster Foodbank is very grateful for our support and our donations will help many local families in need. Christmas Readings and Carols Service 2018 - Our Christmas Readings and Carols Service is always a special occasion and the perfect way to finish the autumn term. The children joined in the carol singing with great enthusiasm! Thank you to everyone who filled their Christingle boxes with coins, with the proceeds going to The Children's Society. In 2018, children in Year 5 performed 'Bethlehem' and 'Spread the Joy' also. Pictured below are children presenting their performance of two carols in St Mary's Church. 'Experience Christmas' Workshops at St Mary's Church - We are very grateful to members of St Mary's Church for organising a wonderful afternoon workshop session for both Year 3 classes to help them learn more about the Christmas story. Children moved around the different 'stations' meeting the angel Gabriel, finding out more about the journey to Bethlehem, meeting one of the shepherds and a wise man. They took part in activities at each station including craft and dressing up, with time for a drink and biscuit too. The children learned many new things about the Christmas story. Thank you to Reverend Amanda and everyone at St Mary's Church for providing such an enjoyable afternoon of learning! Click on the first picture below to view a photograph gallery from our 'Experience Christmas' workshops. 'Experience Easter' Workshops at St Mary's Church - Both Year 3 classes had a wonderful afternoon at St Mary’s Church, taking part in an ‘Experience Easter’ variety of activities that helped them to learn more about the Easter story. Children waved palm branches to remember Jesus coming to Jerusalem on Palm Sunday; made collage cross fridge magnets; created a lovely large craft collage on the theme of ‘He is Risen’; took part in an experience of the Last Supper and even visited the empty tomb. Thank you to everyone at St Mary’s for making this such an enjoyable and memorable experience for the children. Our French pen friends shared details of their Easter church service with us. Visit our 'International Links' page to find out more. 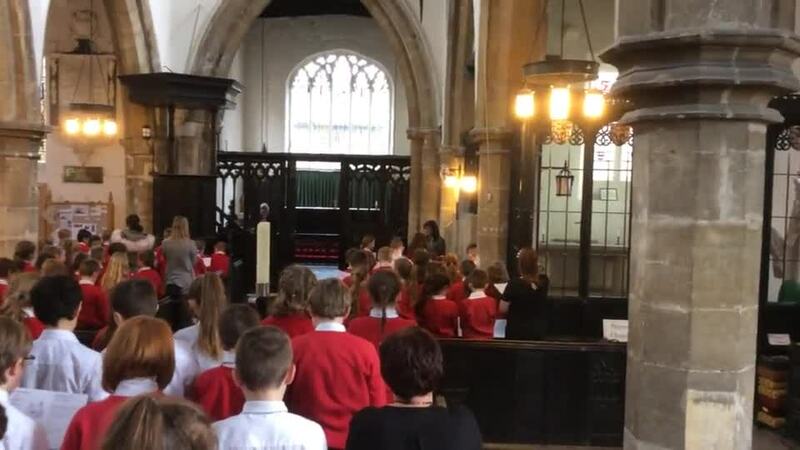 Year 3 Visit to St Mary's Church - Reverend Amanda planned a very engaging curriculum visit for Year 3 pupils, to help them learn about the different features of a church and to find out more about the fascinating history of St Mary’s Church. Children worked in pairs as detectives to see if they could find features from clues such as ‘a spy hole’, ‘men on a beach’ and ‘some white feathers’. Once the children had found all the features, Reverend Amanda explained the history and significance of each one. Click on the first image below to view our carousel of photographs. Members of the Methodist Church work closely with Year 4 pupils each year. The 'Godly Play' sessions include visits to the Methodist Church and workshop sessions in school. The sessions are very lively and engaging and encourage children to explore their values and beliefs. Reverend Frank also comes to deliver some whole school acts of worship. Below are some of the photographs from a 'Godly Play' session at the Methodist Church, when children found out about all the different jobs undertaken by Reverend Frank. Then, the children learned about all the different and important features in the church and took part in a quiz! In the second Godly Play session, Godly Play visited the school and taught the children all about the 10 Commandments. The children had fun learning about these and then enjoyed discussing some of the rules that they have to follow. Year 4 classes visited the Methodist Church for a Christmas workshop led by Mr Banks. Children thoroughly enjoyed taking part in a variety of craft activities and learned more about the Christmas story. In ‘Godly Play’ visits to school and the Methodist Church, children have learned about the Easter story through craft and story sessions. Many thanks to Harpinder, who visits school to support our R.E. teaching about aspects of Sikhism in Year 4. In the gallery of photographs below, children learned about the 5Ks and what is special about a Sikh wedding. 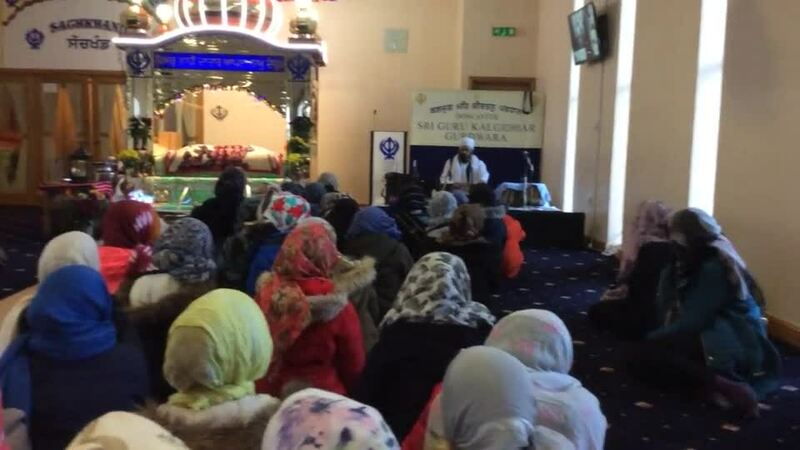 Year 4 were warmly welcomed to the Sikh Gurdwara in Doncaster. Children learned so much from their visit and children were praised by the Sikh faith leaders for their interest and the huge amount of knowledge they already had. Following our visit to the prayer hall, where the book of Sikh scripture, the Guru Granth Sahib is kept, children enjoyed the 'Langar'. The community kitchen in a Gurdwara is where a free meal is served to all visitors. We learned the free meal is always vegetarian so it is suitable for all visitors. At Langar, all people eat a meal as equals. We greatly value the regular visits of the 'Open the Book' group from St Mary's Church. Stories from the Bible are brought to life through drama and discussion, in such an engaging way that captures the pupils' interest and supports their reflection. Our ‘Open the Book’ assembly is always a highlight of the week. Their presentation of 'Daniel and the Lion' was so dramatic you could have heard a pin drop in the school hall. In Year 5, our delivery of R.E. is enhanced by the ‘Bible Explorer’ sessions led by Mr Barlow. Children learn about the stories of the Old Testament in a very lively and active way that involves all the children. Bishop Philip of Burnley visited school and led a lively and engaging worship for the whole school. Afterwards, he enjoyed meeting and talking with our pupils. Long Term Plan for R.E. Year 6 children created PowerPoints to help children in Year 4 learn about Judaism. Please click on the first image below to view our gallery of R.E. work. As part of their project 'A Child's War' and their R.E. unit of study on 'War and Suffering', Year 6 learned about the Christmas Day Truce of 1914. This inspired Year 6 to write poems about this remarkable event.